Recently, Corporate Social Responsibility (CSR) has become the global trend. Not only listed companies but also small and medium-sized enterprises are keen to take a strategic approach in their CSR undertaking to develop their own competitive advantage. 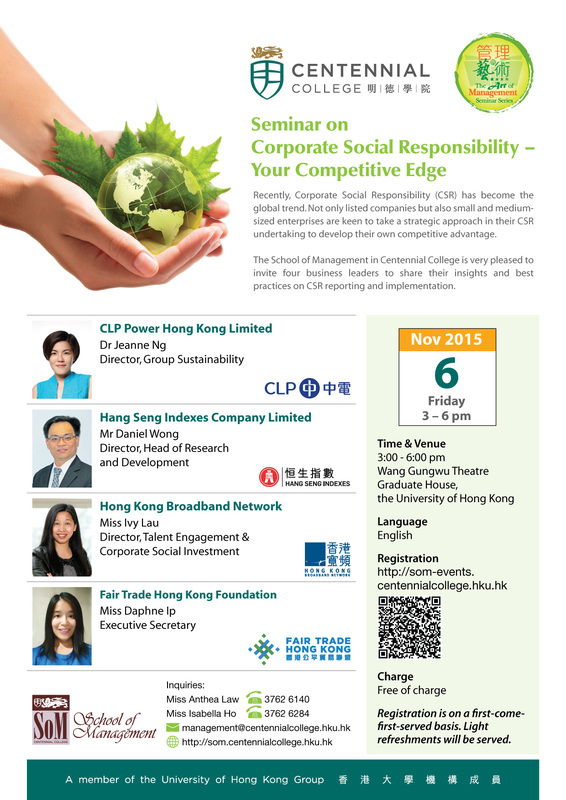 The School of Management in Centennial College is very pleased to invite business leaders from big corporations such as CLP Power Hong Kong Limited, Hang Seng Indexes Company Ltd, Hong Kong Broadband Network and Fair Trade Hong Kong Foundation to share their insights and best practices on CSR reporting and implementation.